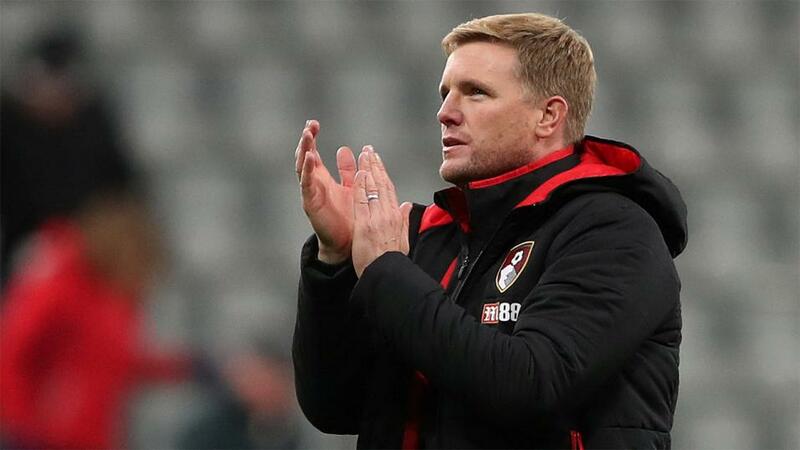 Will Eddie Howe be applauding his Bournemouth side after their match with Huddersfield? Both Bournemouth and Huddersfield will be looking to bounce back from weekend defeats. Opta weighs up the odds. "Huddersfield lost 4-0 at the Vitality Stadium against Bournemouth last season in the Premier League, conceding from four of the five shots on target they faced in the game." A Bournemouth win is [1.77]. Bournemouth are unbeaten in six home matches against Huddersfield Town in all competitions (W3 D3) since losing 0-1 in League One in August 2007. The draw is [3.85]. Huddersfield lost 4-0 at the Vitality Stadium against Bournemouth last season in the Premier League, conceding from four of the five shots on target they faced in the game. A Bournemouth win is [1.77]. Bournemouth are looking to avoid five consecutive league defeats for the first time since March 2013, when they were in League One. Huddersfield are [5.5] to claim victory. Bournemouth have lost their last two home Premier League games, as many as they had in their previous 15 at the Vitality Stadium (W8 D5 L2). Huddersfield are [4.1] in the Draw No Bet market. Huddersfield haven't won a midweek top-flight game (Tuesday, Wednesday, Thursday) since March 1971 (3-0 vs Crystal Palace), drawing six and losing eight since then. Bournemouth are [1.31] Draw No Bet. Following their 2-0 win at Wolves in their last away game, Huddersfield are looking to secure back-to-back top-flight victories on the road for the first time since April 1956. They are [2.28] to avoid defeat in the Double Chance market. Huddersfield have scored fewer second-half goals than any other Premier League side this season, netting just twice after half-time. Bournemouth are [2.8] to win half-time/full-time. Huddersfield are the only side in the top four tiers of English football not to reach double figures for goals so far this season. The Terriers have netted just nine times in 14 games. Under 2.5 goals is [1.98]. Bournemouth striker Callum Wilson has scored five league goals against Huddersfield - all his goals have come in 4-0 wins; two in August 2014 and a hat-trick in November 2017. Wilson is [2.9] to find the net. Bournemouth's Callum Wilson has scored seven goals in his 14 Premier League games this season, just one fewer than he managed in 28 league matches last term. He's [5.2] to open the scoring.